AXIOMTEK, a world renowned provider of industrial and embedded systems and components, today announced the latest addition to its 5.25-inch Petit Single Board Computer (SBC) product line. The new AXIOMTEK SBC83810 SBC is ideal for an array of applications and systems requiring high-bandwidth, low-power and low-thermal embedded computing. The Petit SBC is powered by an IntelÂ® PentiumÂ® M processor with Intel 855GME852GM Graphics Memory Controller Hub and 6300ESB I/O Controller Hub core logic chip set and is equipped with multiple I/O features for maximum system design flexibility and performance. The SBC83810 SBC architecture delivers the flexibility, performance and high scalability required for today's cutting-edge embedded computing applications. The board comes complete with an onboard Intel Pentium M processor; the Intel 855GME852GM and 6300ESB core logic chipset; a DualView LVDS LCD interface; 4 COM ports; PCI-X, PC/104+ and mini PCI Extension interfaces; with support for Serial ATA-150. Optimized for a 400 MHz system bus, the SBC83810 is a complete integrated computing platform solution for manufacturers, software developers and system integrators seeking fast deployment of next generation systems to maximize their competitive advantage while minimizing development time and costs. As a value-added service to SBC83810 customers, AXIOMTEK offers its eSmartÂ custom integration services to further reduce development times. In as little as 30 days, AXIOMTEKÂs professional engineers will perform custom integration work on the SBC including device drivers and IRQ settings; embedded O/S support, customer proprietary device drivers and applications; bootloader and utilities as required. The end result is a PC board tested, validated and ready for mass production, while customers are free to concentrate on their own core competencies in software development and systems integration. The SBC83810 is available immediately with pricing dependent on customerÂs required configuration. The AXIOMTEK 5.25-inch Petit product line now includes eight SBCs and seven riser cards. Founded in Taiwan by a group of young and aggressive engineers in 1990, AXIOMTEK has been acknowledged as one of the major design and manufacturing companies for diverse and market niche solutions in a wide array of industrial and embedded applications. Since the companyÂs establishment, it has successfully gained worldwide recognition for its innovative designs, product quality and exceptional customer service. Today, AXIOMTEK offers a wide range of products including Industrial Computer Chasses and Workstations, Super Slim Panel PCs and HMI Solutions, Data Acquisition Systems, Single Board Computers from 386 to Pentium II/III, PC/104 Modules, Embedded Computers in every conceivable form factor, CompactPCI systems and more. AXIOMTEK employs an international distribution network with tracking and inventory control located in Taiwan, USA, China and Germany to ensure rapid delivery of customer orders. The company can be found on the Web at http://www.axiomtek.com. 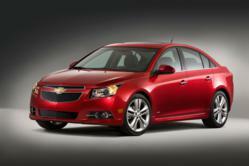 Choosing a car for the family can be difficult and expensive. Kentucky Accident Attorney Mike Schafer wants to help you make a good choice. EBV establishes a lifelong dormant (latent) infection in some cells of the body's immune system and can lead to various diseases over time. How can an infected person help prevent the latent EBV from causing problems later in life? polyDNA recommends that individuals concerned about the risk of EBV infection stop smoking. 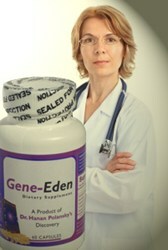 In addition, because EBV is so common, everyone should consider using Gene-Eden-VIR, a natural anti-EBV remedy, to boost the immune system against the latent virus. St. Louis County Librarys popular summer reading clubs will kick-off early this year starting May 13 and running through August 3. The library offers clubs for all ages: babies, kids, teens and adults, with fun programs and great prizes for each age group. Participation is free, and as an added incentive, preschool children through those entering 12th grade will have their fines waived when they sign up for a summer reading club (some restrictions apply). Registration begins May 13; simply stop by any St. Louis County Library branch to sign-up. Teens and Adults can register online at http://www.slcl.org/summer-reading-clubs. Parents, keep track of how many books you read to your little one and how many library story times you attend on the log sheet you receive when you sign up. Bring the log sheet to the library when you reach each prize stop. Prizes include O Balls, board books and tickets to the Magic House. Kids, track the number of minutes or books read on a special log sheet. Bring your log sheet to the library when you reach each prize stop and earn great prizes. A full line-up of great programs will be featured including live performers, crafts, puppetry, animals, movies, treats, and, of course, stories. Prizes include giant beach balls, excavation kits and a chance to win Cardinals tickets. Kids who complete the club will receive a pass to one of five Library Nights at the Magic House (pass includes free entry for one child and up to two adults). In addition, kids who complete the SRC bonus round will be entered into a raffle for additional prizes. Teens can earn points by reading books, magazines, graphic novels, and listening to audiobooks. Register and keep track of your reading online at http://www.slcl.org/teens or pick up a log sheet at your nearest branch. When you complete a level visit a branch to collect your reward. Programming includes laser tag, stop motion animation workshops, tye-dye t-shirt tutorials, cupcake decorating and more. Grand prizes include a Kindle Fire (one winner per branch! ), a mountain bike, a Dell laptop and an iPad 2. The Adult Reading Club encourages participants to complete six books during the 12-week period (May 13 August 3). Individuals who complete the club will receive a beverage tumbler, a coupon for a free sundae at Sonic, and a buy-one-get-one-free coupon for a 6-inch sub at Penn Station. People who complete the program will also be entered into raffles to win gift cards from Barnes & Noble and the St. Louis Bread Company. Other prizes include Mary Engelbreit tote bags and tickets from the St. Louis Cardinals and Wehrenberg Theaters. 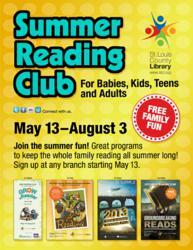 Stop by your local branch to register or sign-up online at http://www.slcl.org/summer-reading-clubs and start reading! Summer reading club program guides are available at all SLCL locations. For more information, visit http://www.slcl.org/summer-reading-clubs or call 314-994-3300. Let's face it, most of us are busy, but are we too busy to live a healthy lifestyle? We try to avoid convenience food and make a whole-hearted effort to visit the gym, but due to the helter-skelter demands of life, we are running on empty. Because of this, our nation's health is no longer a priority. Even worse, our impressionable children bare witness to this routine and believe convenience food and inconsistent exercise is normal. This lifestyle is making it increasingly difficult to get the family together for quality time and family fitness. Our nations health is at risk and convenience food, along with being time poor is to blame. Its so easy to pick up drive-thru food on the way home from work, the gym or soccer practice. However, this obliterates a workout, as one meal of this calorie dense food is equivalent to several nutrition dense meals. So, how does one implement a family fitness plan? Its actually easy and Team RundleFit of Workout Anywhere has the master plan! RundleFits site: Workout Anywhere, is the perfect program for the whole family and totally time efficient. Their home workouts are actually anywhere workouts for home, work, the park, hotel room or anywhere. Since most of their workouts consist of bodyweight, core and plyometric exercises, the whole family can participate. As well, every weekly workout video has a beginner, intermediate and advanced version. Meaning, a true beginner to fitness can workout side-by-side the advanced level. Every workout has a unique circuit of total body, core and conditioning exercises, but with distinct variations for each level. Just turn on the Ipad, phone, computer or smart TV and one can Workout Anywhere. RundleFit knows everyone is busy, especially families. With that in mind, time is not an issue for Workout Anywhere. Home workouts last 15 to 20 minutes and if their Four Minute Total Core Training videos are added, one can still finish under a half hour. Workout Anywhere provides the perfect smart training approach to fitness because they implement exercise science principles to make workouts lean muscle building/muscle-sparing and fat burning, without requiring a huge time commitment or trip to the gym. As well, the efficient and effective nature in tandem with new weekly workouts, crushes monotony and engages the whole family into the ultimate family fitness plan. So, round up the whole family for only 15 to 20 minutes and make family fitness a priority. Access Workout Anywhere for new family friendly weekly home workouts, meal plans, recipes, challenges and coaching for only $ 9.95/month. The motorhome exhibition, which will take place Wednesday, Thursday, Friday, and Saturday, June 19, 20, 21, and 22, 2013, is part of a convention of an international motorhome owners club, Family Motor Coach Association, based in Cincinnati. Major motorhome manufacturers and dealers will be bringing new motorhomes to Gillette for convention attendees to tour. Plus, other companies will display their wares inside the Wyoming Center, making available RV accessories, components, supplies, campground information, and more. On Wednesday, June 19, from 5 p.m. to 8:30 p.m., a special preview of only the motorhome exhibits will take place. Regular hours for the motorhome displays will be 9 a.m. to 5 p.m. on Thursday, Friday, and Saturday, June 20, 21, and 22. Hours for the displays of RV accessories, supplies, and components will be 9 a.m. to 4 p.m. on June 20, 21, and 22. The daily fee for viewing motorhomes and booth displays is $ 5 per person; children 12 and under admitted free when accompanied by an adult. Individuals with an active military ID will be admitted free also. A Daily Passport that provides admittance to the exhibits, all seminars, and evening entertainment is available for $ 65 per person ($ 55 for FMCA members). The admission fee on Wednesday covers admission on Thursday as well. Free public parking will be available at CAM-PLEX. Take Boxelder Road to the entrance at Broken Spur Road and follow the signs to public gate parking. Those who own a motorhome or other self-contained RV are invited to take part in all of the activities and to stay with the rest of the group at CAM-PLEX. The gate price for non-FMCA members is $ 245 per RV (with two people); this non-member fee automatically grants a one-year FMCA membership or Family Motor Coaching magazine subscription to the RV owner. The FMCA member price is $ 195. Convention attendees will be able to check out the latest features and innovations that are available in motorhomes. Some of the displays will include production-line units, and others will demo custom-built coaches for uses ranging from family camping to transporting high-tech business equipment, or for use as conference coaches. A great variety of motorhome styles and a broad price range will be represented. Motorhomes are a popular travel option. According to a recent consumer study conducted by the University of Michigan, U.S. ownership of RVs has reached record levels. Nearly one in 12 U.S. vehicle-owning households now owns an RV. In addition, the potential for future growth in RV ownership in general in the United States is considerable. Sales of recreation vehicles are expected to increase as baby boomers move into their prime RV-buying years. Industry officials believe that the advantages of RV travel in today's climate will help to drive market growth. Families want to spend quality time together and prefer the greater freedom, flexibility, control, and comfort RVs provide. Younger consumers and empty-nesters are both realizing the advantages of RVing over other forms of travel. The RV exhibition is just one element of the Family Motor Coach Association motorhome owners convention. Approximately 2,500 families will travel from across North America in their motorhomes to take part in the event, and some 8,000 people will be on hand. The convention will include RV seminars on topics relative to RVing; evening entertainment; and various social events. And since the motorhome owners group is celebrating its 50th anniversary in 2013, the event in Gillette will serve as the organizations official birthday bash. A number of special activities are planned to commemorate the event, including a display of vintage Flxible motorhomes the classic coach that appears in the associations logo and a nostalgia room filled with memorabilia. For more information, visit FMCA.com or call (800) 543-3622. Family Motor Coach Association (FMCA) is an international organization for families who own and enjoy the use of self-contained, motorized recreation vehicles known as motorhomes. The association maintains its national headquarters in Cincinnati, Ohio, and currently has nearly 80,000 active member families. FMCA offers its members a number of benefits, including a subscription to its monthly magazine, Family Motor Coaching; trip routing; mail forwarding; group rates on a medical evacuation program and motorhome insurance; discounted rates for RV tours and caravans; and a tire purchasing program. Perhaps the most important benefit of FMCA membership is the camaraderie and friendships that develop among people enjoying the common interest of motorhome travel and recreation. The organization can be reached toll-free at (800) 543-3622 or on the Web at FMCA.com.